It’s almost here. From January 14-19, Austin’s Bass Concert Hall will present the incredible and thrilling performance that is Green Day’s “American Idiot” musical at the Texas Performing Arts’ venue on The University of Texas campus. The Tony Award-winning show captures the story captures the story of three adolescent friends finding themselves in a different world, post 911. “Since its inception, audiences have been surprised by the emotional journey the show takes them on, told almost exclusively through Green Day’s songs, including many they are already familiar with and love,” said Tom Hulce, producer. “This is such a potent time for our country and the search of our characters for what to believe in is gorgeously celebrated through Billie Joe Armstrong and Green Day’s wonderfully lush score,” he added. 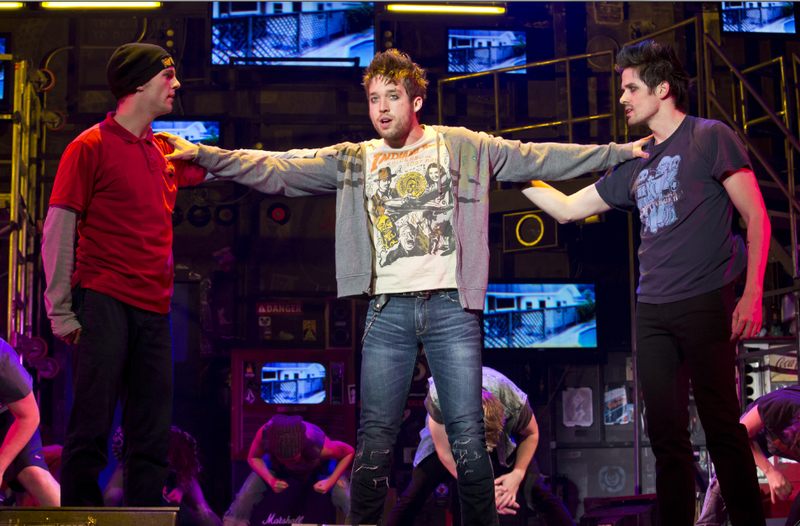 Dan Tray (Tunny), Jared Nepute (Johnny) and Casey O'Farrell (Will) in AMERICAN IDIOT. Photo by Jeremy Daniel.